Living near the Pacific Ocean provides numerous benefits to the people of Southern California. Not only do we enjoy the beauty and peacefulness of the water, but we also benefit by the economic wanderlust it provides. The Port of Los Angeles is one of the world's largest trade gateways. It's a massive complex covering 7,500 acres with 43 miles of shoreline, entangled with channels, berths and marinas. It's nestled next to the Port of Long Beach. The ports of Los Angeles and Long Beach are jurisdictionally separate, but share San Pedro bay and serve as one giant port complex. The ports are connected directly and indirectly with tens of billions of dollars in industry sales each year in the Los Angeles region. The sales equate into hundreds of thousands of local jobs and billions of dollars in wages, salaries, tari?s and taxes. Specifically, the Port of Los Angeles provides 133,000 jobs in Los Angeles, $76 billion in California trade value, $270 billion in U.S. trade value, and $5.8 billion in local and state tax revenue. If terrorists wanted to cause destruction to the U.S. economy, the Los Angeles-Long Beach complex would be an ideal target for attack. An attack on these ports/waterways could have a tremendous short and medium-term impact on the U.S. economy. This clearly illustrates why the security of our ports is crucial to the success of the trade industry. Maritime ports are a major component of the nation's freight transportation system and handle 75 percent of Americans' international trade by volume. Port security refers to the defense, law and treaty enforcement, and counterterrorism activities that fall within the maritime domain. Port security includes the protection of the actual seaport, the protection and inspection of the cargo moving through the ports, and maritime security. Most of the largest seaports are near major population centers, such as the Port of Los Angeles, which further allows for potential grave destruction and amplifies the need for port security. The term "port security" involves a broad effort to secure the entire maritime supply chain, from the factory gate in a foreign country to the final destination of the product in the United States. Since the terrorist attacks of 9/11, port and harbor security have become crucial factors in the success of our economy. Within the parameters of port security falls the major concern of supply chain security. Supply chain security refers to the precautions taken to ensure the security and integrity of the supply chain. Many threats face our supply chain such as theft, counterfeiting, piracy and cyber security. The need to secure ports and the supply chain providing goods into the ports primarily results from two concerns: first is the concern of moving goods from one place to another and the opportunity it provides for terrorist activity; the second concern is the ports themselves present desirable targets for terrorists. Ports are a significant bottleneck for a massive amount of economic activity. It is imperative we protect our supply chain to secure our national interests. Temporarily shutting down a major U.S. port could impose significant economic costs throughout the United States and the world. It's interesting to note that while most of the world's trade travels by sea, the ocean voyage is only one element in a complex chain. In a routine door-to-door journey using a shipping container would involve the interaction of approximately 25 different actors, generate 30 to 40 documents, use two or three different modes and be handled at about 12 to 15 physical locations. The complex web of people, interactions, movement and information associated with the international journey can be broken down into three principal flows/chains of custody: 1) Movement of goods from place to place; 2) Movement of custody from person to person; and 3) Movement of information regarding the cargo. U.S. ports require an uninterrupted flow of commerce. The success of these steps in the journey are subject to the vulnerability of the maritime supply chain. There are a number of post 9/11 supply chain security initiatives in the U.S. and abroad aimed at sealing weak points in the global supply chains and moving security efforts beyond the U.S. border. These were enacted to implement compliance and minimize the threat of breaching the supply chain. The Container Security Initiative (CSI) is a program led by U.S. Customs and Border Protection in the Department of Homeland Security focused on advanced screening and potential inspection of containers at foreign ports. The intent is to extend the security outward so that American borders are the last line of defense instead of the first line of defense. The CSI was greatly inspired by the work of James Giermanski, who was an early proponent of supply chain security. The CSI program offers its participant countries the reciprocal opportunity to enhance their own shipping security by allowing the CSI partners to send their customs officers to major U.S. ports to target ocean-going containerized cargo to be exported from the U.S. to their countries. The program consists of four core elements: 1) Using intelligence and automated information to identify and target high-risk containers; 2) Pre-screening containers identified as high-risk at the point of departure; 3) Using detection technology to quickly pre-screen high-risk containers; and 4) Using smarter, tamper-evident containers. The Customs-Trade Partnership Against Terrorism (C-TPAT), which is also a U.S. Customs and Border Protection program, is a joint government-business initiative to build cooperative relationships that strengthen overall supply chain and border security. It aims at getting companies involved in goods movement to seal their supply chains. Companies in the program include importers, logistics specialists, freight forwarders, and others connected with international trade. The C-TPAT encourages shippers and carriers to implement security plans and measurers to promote greater security at all points along the supply chain. Those companies whose supply chains meet the requirements get fewer inspections at U.S. borders, freeing up customs officials to focus on riskier cargo. Businesses must apply to participate in C-TPAT and in doing so, commit to the following actions: 1) Conduct a comprehensive self-assessment of supply chain security using the established guidelines (encompasses procedural security, physical security, education and training, access controls, manifest procedures and conveyance security; 2) Submit a supply chain security profile questionnaire to Customs and Border Protection; 3) Develop and implement a program to enhance security throughout the supply chain in accordance with C-TPAT guidelines; and 4) Communicate C-TPAT guidelines to other companies in the supply chain and work toward building the guidelines into relationships with these companies. 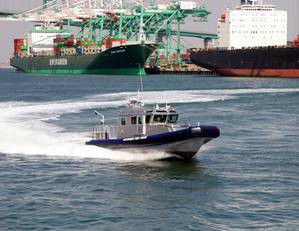 In addition to all of the security measures and incentives provided to secure our supply chains, the Port of Los Angeles has 130 highly skilled and trained sworn officers to defend the harbor. Port Police Officers' range of duties include the safety and security of all passenger, cargo and vessel operations. Whether patrolling by land, sea, air or underwater, the port police are a highly trained group of professionals responsible for port security. Of that precision force, there's a Port Police Dive Team consisting of four full-time members and 21 part-time officers assigned to reduce the risk of underwater threats to the Port's waterways and infrastructure. They also conduct hull searches of high interest vessels to ensure no hazardous devices or contraband pose a threat to the Port community. It's no doubt this highly trained policing force are significant contributors to the success of the trade industry. Port security has become an increased area of concern since the terrorist attacks on our country. Living near the Port of Los Angeles and Port of Long Beach reminds us of the vulnerabilities and costs to our city and nation should a major port be compromised. Ports play an integral role in global economics, and the need for protection of our ports is stronger than ever. We are indebted to the men and women that provide maritime security and the many faucets of protecting and inspecting massive amounts of cargo moving through the ports. Whether the concern is supply chain security, counterfeiting, piracy or cyber security, the demand for secure ports is ever present. Haveman, Jon D. and Shatz, Howard J. Protecting the Nation's Seaports: Balancing Security and Cost. Public Policy Institute of California, 2006. Port Performance Freight Statistics Program: Annual Report to Congress 2016. U.S. Department of Transportation. Security in Maritime Transport: Risk Factors and Economic Impact. Maritime Transport Committee, July 2003. Zalud, Bill. The Daily Challenges of Supply Chain Security. Security Solutions for Enabling and Assuring Business, April 1, 2016. Kessler, Mike. Going Deep with the 25-Man Dive Patrol Keeping the Port of L.A. Secure. Los Angeles Magazine, May 6, 2015. Kelly Hicks is the Space Systems Business Development Operations Manager, Space and Airborne Systems, Raytheon Company, El Segundo, Calif. Hicks graduated from Regis University in Colorado Springs, Colo. with a Bachelor of Science degree in Business Administration in May 1991. She is currently working on her Master of Arts degree in Management and Leadership from Webster University. Prior to Raythen, Kelly served a distinguished 20-year career in Personnel, retiring as a Chief Master Sergeant.